William E. Dodge was, by all accounts, a good man. The problem for many following his death in 1883 was that he was not a great man. The Connecticut-born millionaire made a fortune when he and his father-in-law, Anson Greene Phelps, founded the mining company of Phelps, Dodge and Company in 1833. It grew to become one of the country’s largest mining firms. His business interests went on to include the establishment, with partners, of the Macon and Brunswick Railroad. But the accumulation of wealth was perhaps secondary to Dodge’s idealistic and heart-felt humanitarian and social interests. His compassionate ideals were formed early in life. His father, David Low Dodge, founded the New York Peace Society, a pacifist organization. The peaceful and caring atmosphere of home would affect Dodge’s numerous adult interests. As the Civil War approached he was an outspoken abolitionist and for the rest of his life he would finance schools for black students. Following the war, he turned his focus to the plight of the American Indian. In 1868, with Peter Cooper, he established the United States Indian Commission and worked with Ulysses S. Grant on the Peace Policy with the Native Americans. Dodge was one of the Commissioners who traveled West to meet with representatives of the Arapaho, Kiowa and Cheyenne nations to explain and discuss Government policy regarding Native Americans. When the United States Calvary slaughtered 173 Blackfeet in Montana in 1870—an event that became known as the Marias Massacre—William E. Dodge fought for the prosecution of the commanders in charge. He went on to campaign for an Indian Affairs cabinet department. Dodge was an ardent supporter of the Young Men’s Christian Association and, all the while, served as President of the National Temperance Society. The Society strongly felt that demon alcohol was the source of domestic violence, ruined homes and lives, crime, poverty and other social ills. One means of fighting the scourge of alcohol was the erection of temperance fountains in large cities. The availability of clean, pure water, it was felt, would deter the taking of strong drink. Less than a month after Dodge’s death on February 9, 1883 a movement began, initiated by the Chamber of Commerce of which he had been President for several years, to erect a statue in his honor. A committee was appointed on March 3 “to consider and devise a plan which would most fittingly meet the wishes of the public,” as explained by the Chamber of Commerce later. 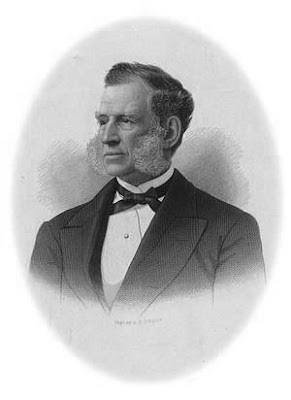 The committee included some of New York’s most respected names in business; Samuel Sloan, John A. Stewart, William H. Fogg and Samuel D. Babcock among them. 380 private donors contributed and eminent sculptor John Quincy Adams Ward was given the project. 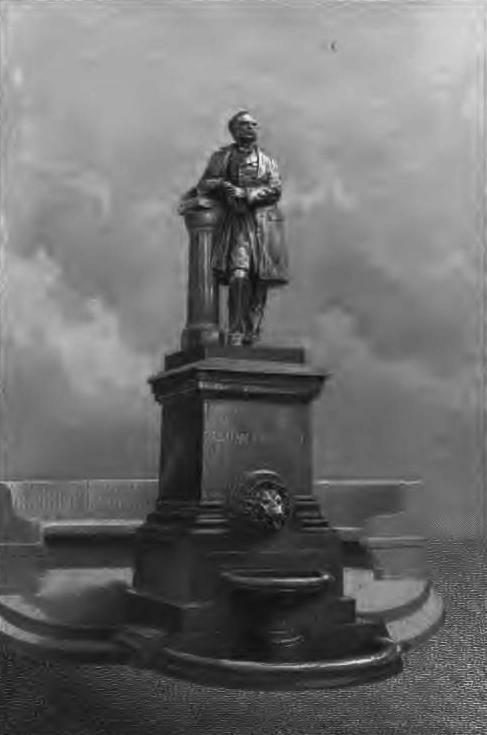 To support the statue, prominent architect Richard Morris Hunt was commissioned to design the pedestal, which appropriately was to include a temperance fountain. Two years later the Academy of Arts examined the finished sculpture. In a letter to the Parks Commissioners, it proposed the site, saying “it is a fine piece of work, and should be erected in the square at Thirty-fifth-street, Sixth-avenue, and Broadway.” Not everyone was pleased. The Editor was vehement that the statue to Dodge should not take up public space. Dodge was a good man. But he was not a great man. The Editor went on to say that the statue would be entirely appropriate as an ornament to Dodge’s tomb, or attached to the headquarters of any one of the charitable institutions he founded or supported. But public statues, it argued, were not for good men. They were for great men. The editorial warned that if the Dodge statue were to be erected on public ground, it would open the floodgates for statues of any person of good moral character whose friends or family could afford to pay for one. The newspaper would not get its wish. On October 22, 1885 the statue was unveiled in Herald Square. Ward had depicted William E. Dodge in the realistic portraiture style for which he was best known. The millionaire businessman and philanthropist leaned casually on a pedestal atop Hunt’s monumental granite base. In tribute to Dodge’s life-long dedication to the avoidance of alcohol, a temperance fountain flowed from the mouth of a lion into a carved basin. 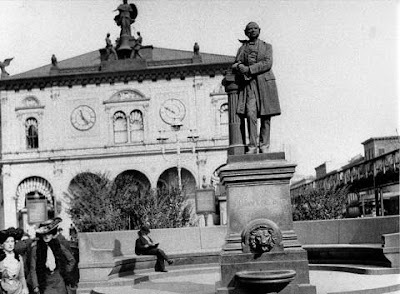 The statue was partly enclosed by a semicircular granite bench. The pamphlet of the unveiling ceremonies included the above photograph --copyright expired. 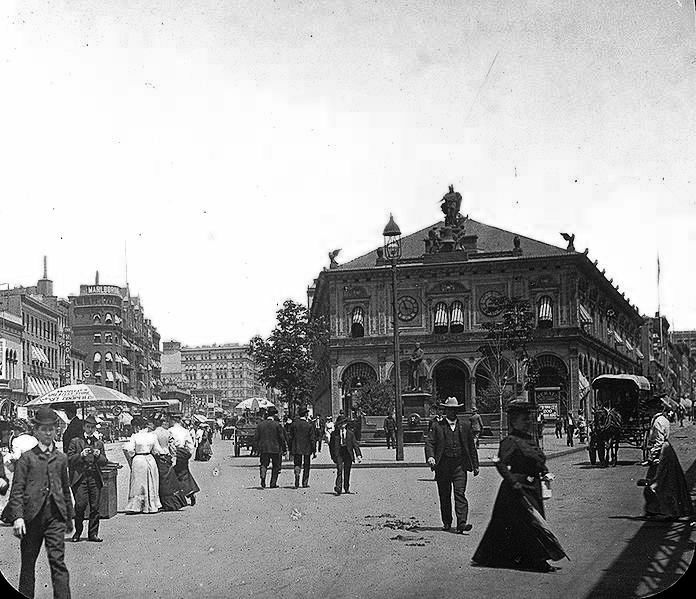 After more than half a century standing in Herald Square William E. Dodge was kicked out. The humiliation was a result of the movement to erect a monument to the Herald’s publisher James Gordon Bennett. In 1939 as preparations for the Bennett memorial began, the Dodge statue was dismantled, crated and stored away. In the process, Richard Morris Hunt’s imposing pedestal was purposely destroyed. The newspaper clearly misspelled Dodge’s middle name, adding an “E” at the end. But the mistake could nearly be excused when the new, bland granite base was examined. Here, too, Dodge’s middle name was spelled EARLE. Chiseled deeply into the base, the superfluous E could not be rectified, so today each of the other letters is gilded with the hope that the unadorned E will blend into the stone. The William Earl Dodge statue stands proudly in Bryant Park despite its several embarrassments, a monument not to a great man, but to a good one. Poor guy... Pigeon poop and all! BTW, have you done a specific posting for the (lost) New York Herald Building? I tried searching the blog but this site doesn't have the best search features or I am just not doing it "right". Let me know and thanks. I haven't done a posting on the Herald Bldg and it's a great story. Thanks for the nudge!